I finally finished the Lenora poster! It took some serious thinking for the colors because I didn’t really think it through when designing it. Sometimes I know exactly what colors I want where, other times not. This time was sort of like “hmmm, I think she should be wearing a pale yellow tutu… or maybe pink.” So there was that initial choice that determined all the others. Went for a combo of delicate and bold. Her character is a balance of tender, slender lady candy and, well, the man-made machinery that lies within. 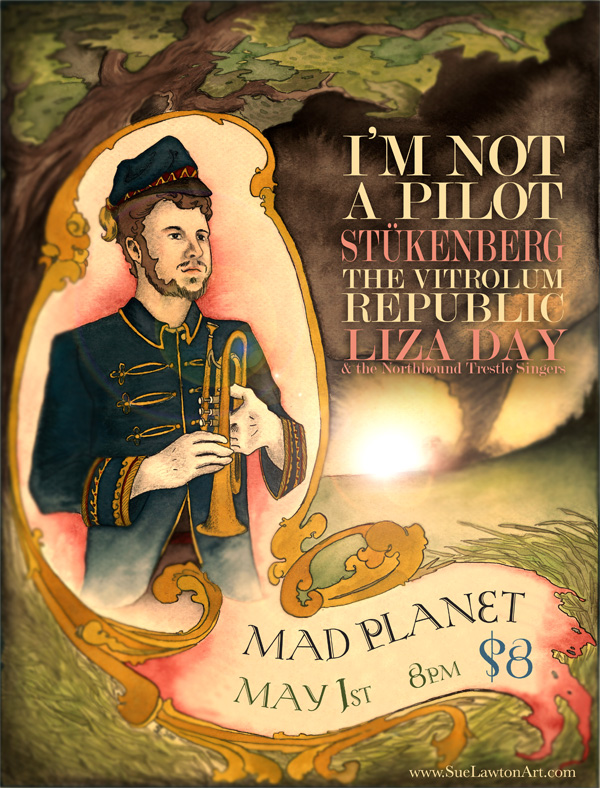 In other news, the Vitrolum Republic and a slew of other great bands are going to be playing at Mad Planet next month and are using my bugle boy as their poster! Nick Waraksa added some fantastic effects and replaced the text.